Brighton has a seaside village atmosphere with an emphasis on nature and serenity. However, it is close to the M1 (motorway) entrance which gives you easy access to the Sunshine Coast and Gold Coast and to the city by rail. Happiness Cottage is 1km from the beachfront and also 200m to Peace Park surrounding the Third Lagoon and its bikeways and walks. 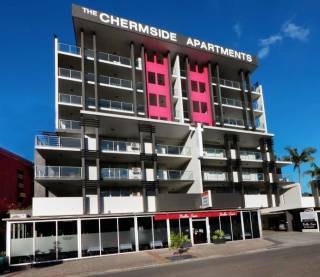 There are restaurants, coffee shops and fish n chips shops in the nearby Sandgate Village centre and a lovely 5 km walking/biking track along the Shorncliffe/ Sandgate/ Brighton beachfront (Flinders Parade). Both our Brighton Cottages are very private for a memorable getaway or relocation with or without your pets. Happiness Cottage is a new build and is light filled and cool with huge sliding doors and screens opening up onto a breezy north facing deck and aromatic tropical gardens. The cottage has every convenience, and is fully equipped with kitchen utensils, appliances, linen,laundry and air conditioning. Guest have access to free wifi; a 42 inch TV and DVD; and an undercover carpark. The cottage has one bedroom with a king sized bed and a beautiful spacious bathroom with stone tiles and bath stool. Even if staying up to six months, electricity is free. For short staysof up to 2 nights, the cottage can sleep extra: one other adult in the king single size sofa or 2 children as it has 2 sofas. We welcome pets and as pet owners, we believe in taking pets on holidays. Your pets will adore the garden for foraging and exploring and are welcome inside as the floors are timber. There is a pet door. The area has 2 off-leash dog parks and also allows leashed walking of dogs on the beachfront and the nearby Peace Park. This is an upmarket pet friendly cottage and is kept beautifully clean - covers washed after each guest departs. The cottage is in a very safe neighbourhood. The street is a quiet street hiding gorgeous tranquil Brighton Cottages: Happiness Cottage and the two bedroom Paradise Cottage! 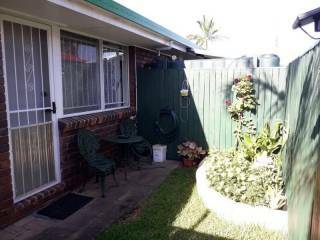 Both cottages are quite separate and privately situated from one another by gardens and a covered carport..
Our Paradise Cottage Brighton (the two bedroom cottage) has great reviews as has Happiness Cottage and both are available for holidays and 1 - 6 month relocations. These cottages are the perfect place to begin your search for a longer term rental/lease in north Brisbane if you are relocating. Our other pet friendly securely fenced cottages also on AURA. If you are travelling north, try Riverside Cottage South Rockhampton, 8 hours from Brisbane - perfect for couples and one other. If you like fishing it is right on the Fitzroy River. 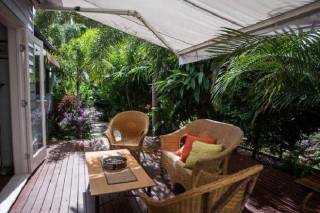 Sunshine Coast - try Mudjimba Beach House - 250m from the surf beach and sleeps 4-6 but cosy enough for a couple and also Mudjimba Cottage Couples Retreat that is very popular with couples and singles with their pets. Pets to have medications up to date in consideration of other pets in the future. Pets not to be left alone if suffering from separation anxiety. Smoking allowed only on the balcony - please shut the doors and louvres leading into the cottage if you smoke. Leave the cottage as you found it. 30% deposit on booking and the remainder 4 weeks before arrival. Cancellation less than 4 weeks before then deposit is retained. Cancellation less than 2 weeks before arrival then all fees retained. There are howver compassionate grounds so speak to the owner. Relocations: 30% deposit on booking then on arrival 2 weeks in advance as per a rental agreement. Give 2 weeks notice on leaving. Cancellation as per above. Phone the owner for access details. Arrivals are allowed at any time after 2pm - including late at night.